The tax payments indicator reflects what citizens and businesses pay for their government. Government activity increases as the scale of economic activity increases, and the relative burden of a dollar in taxes will depend on income levels of citizens and businesses. A generally accepted measure of the size of the tax burden is tax payments as a percent of income. For this measure to be comparable across states, the measure must combine local and state taxes because states allocate the responsibilities of government differently between localities and the state. States must make a trade-off when choosing their tax rate. On one hand, taxes fund valuable government services that would not generally be provided by the market or are not appropriate services for the private sector. These government services (such as the provision of law and order, education, transportation, and social services) facilitate business activity and improve the quality of life of residents. On the other hand, studies have found that a high tax burden, at least for certain types of taxes, can harm the state's business climate and competitiveness by reducing profits and, consequently, reducing the growth of income and employment. Ultimately, finding the right balance will affect the quality of life of residents and the health of the state's economy. The state and local tax burden measures the tax payments collected by state and local governments as a percent of income (individuals and businesses) earned in that state. One of the most often cited measures of tax burden is published by the Tax Foundation. 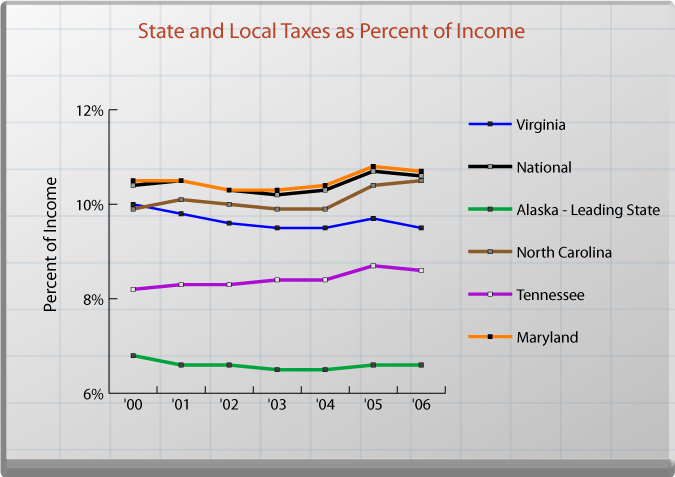 According to the Tax Foundation, in 2006 Virginia had the 10th lowest state and local tax burden in the country at 9.5 percent of income. Alaska's state and local tax burden was the lowest at 6.6 percent. Tennessee had a lower rate than Virginia at 8.6 percent. Maryland and North Carolina were both higher than Virginia at 10.7 percent and 10.5 percent, respectively. The national average was 10.6 percent. A subset of the state and local tax burden comes from corporate taxes. The Tax Foundation provides a Corporate Tax Index Rank for 2007, which captures the business tax environment by incorporating both the rate structure and the composition of the tax base. In this ranking, Virginia has the 5th best corporate tax index rank in the nation, placing it above its peers. Maryland ranked 7th, Tennessee 12th and North Carolina 25th best in the nation. Wyoming, Nevada, and South Dakota, which have no general corporate tax, received the highest scores. State and local governments choose what taxes and tax rates to impose. Unlike some states, in Virginia, the state government retains significant control over both state and local taxes and has imposed maximum rates on many local taxes. Localities in Virginia can only levy taxes in those areas authorized by the General Assembly. Localities do, however, retain control over the property tax rates that are levied. The choice of the mix of taxes also helps determine the tax burden. Some taxes are paid by people outside of the state, for example, lodging taxes paid by out-of-state tourists. Shifting taxes toward those taxes paid more by non-residents can lower the local tax burden for a given level of state expenditures. The state government's role is to design the tax system, choose the optimal rate of taxation and collect the taxes. An ideal tax system should be simple, transparent, equitable, and efficient. Given that some of these goals can conflict, states must choose how to balance these goals when designing their tax system. The state government also must choose the optimal rate at which to tax in order to match the preferences of residents. Finally, the state government is responsible for developing an efficient and effective method for collecting the taxes. Source: The Tax Foundation income estimate is Virginia's share of net national product (NNP) published by the Commerce Department's Bureau of Economic Analysis (BEA). NNP, which includes profits and excludes depreciation, provides a better measure of "spendable" income than (1) gross domestic product (GDP), which includes depreciation, causing it to overstate income; or (2) personal income, which does not include profits (that contribute to income through capital gains, dividends and interest) causing it to understate income. The rank looks at both the (1) corporate tax rate structure, including the level of income at which the top bracket kicks in and at the number of tax brackets, and (2) the composition of the business tax base, including the availability of credits, deductions and exemptions; the ability of taxpayers to deduct net operating losses; and a host of small tax base issues. The tax burden estimate should not be viewed as a measure of the size of government or its relative efficiency for at least two reasons. First, the burden of a severance tax, or tax on natural resource extraction, typically falls mostly on the owners of the resources. The owners generally have little influence on the market price and, therefore, must absorb the tax, regardless of who physically pays the tax. Paradoxically, severance taxes are among the least damaging types of taxes for a state's economy, since the resources taxed are not mobile and extraction cannot be moved to lower tax states. The Tax Foundation, however, includes the tax paid by the natural resource purchaser in the purchaser's state tax burden. As a result, in states with large private oil resources, such as Texas, the Tax Foundation's estimate understates the burden placed on the owners of the land. In the case of Alaska, the state with the lowest tax burden, the oil reserves are primarily on federal land and, thereby, the burden falls mostly on the U.S. treasury. The low tax burden does not, however, imply that the Alaskan government is smaller or relatively more efficient. Second, the Tax Foundation's tax burden estimate does not include the federal government's share of the states' tax burdens. Although the federal government does not pay state taxes directly, those who provide services to federal agencies do pay taxes. A substantial share of these tax payments are shifted to the federal agency purchasers through higher prices. Any shift in payments should not be counted as part of the local tax burden. Because of the very substantial share of federal expenditures in Virginia's economy relative to other states, not accounting for this tax shifting effect will overestimate Virginia's tax burden relative to other states.